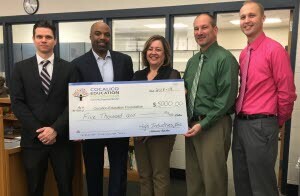 High Companies has contributed $5,000 toward the renovation of the Cocalico Middle School library. The donation will help pay to convert sections of the existing facility to a media center to support an expanding curriculum in digital media. The Cocalico School District plans include a recording room with a green screen to support classroom media creations, a 3D printer, projectors for large group instruction and faculty meetings, robotics, and spaces for digital collaboration. The High grant is funded through the Pennsylvania Department of Community and Economic Development Educational Income Tax Credit (EITC) program. Demolition will begin in mid-May, with completion of the renovations scheduled for August 16 in time for the 2019-2020 school year which begins August 20.